I attended the District 9685 Conference held in Newcastle last weekend along with Garry, Mandy, Ian , Helmiina, Pam and Tom Bennett. It was very enjoyable with truly inspiring guest speakers. 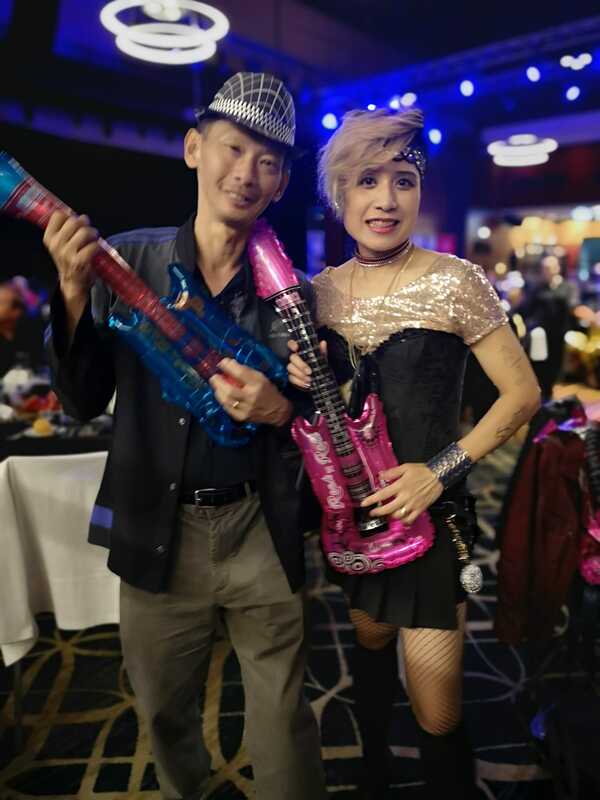 The conference dinner was great fun and highly entertaining with many creative costumes and a fabulous band, the Enormous Horns. The decorated gnome display had to be seen to be believed! Thank you to Pam Bennett who did an outstanding job decorating Gnomez for our club. 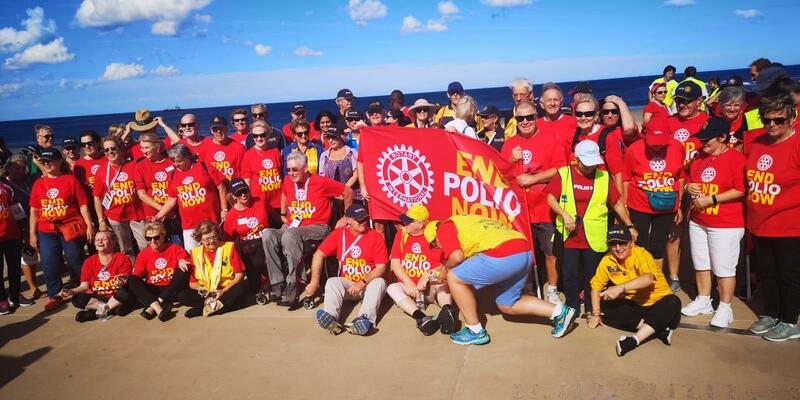 One of the highlights was a Walk Against Polio along the foreshore of Newcastle to Nobby's Beach. There was a sea of red End Polio Now t-shirts as most of the delegates joined the walk. Congratulations to District Governor Susan Wakefield and PDG John Wakefield and their fabulous team for a very successful conference. I have included some photos from the conference in this bulletin. Registrations for 2020 District Conference are now open. 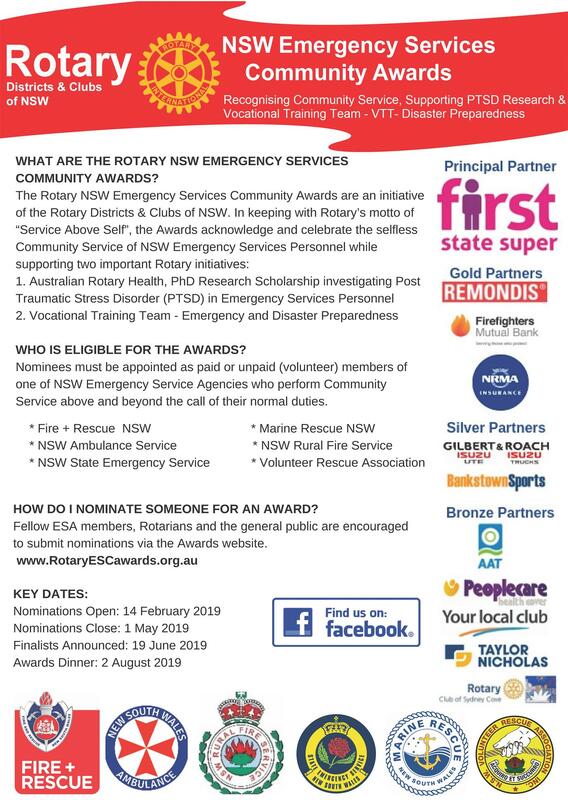 It will be held in Wollongong and is a joint Conference with District 9875. See more information in this bulletin. 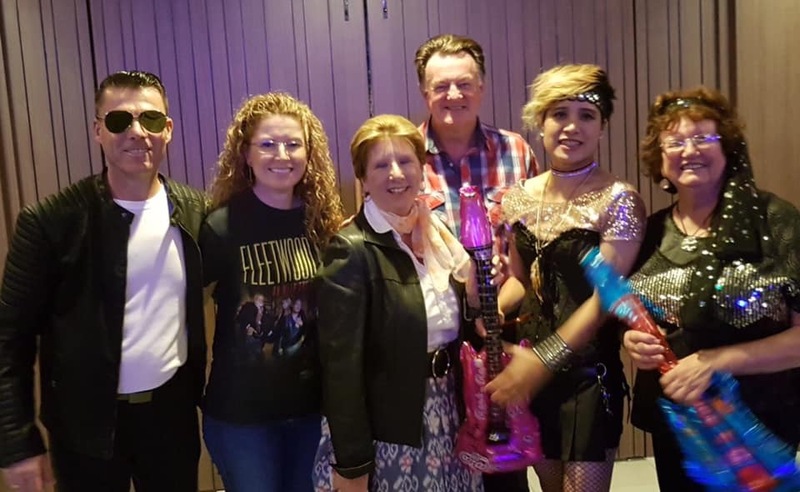 I can highly recommend the conferences to members as informative, inspirational and a great way of getting to meet other Rotarians and have some fun. 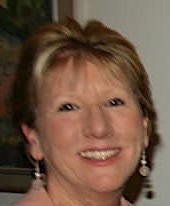 Our guest speaker this week will be Dr Denise Meuldjk from the Centre for Emotional Health. 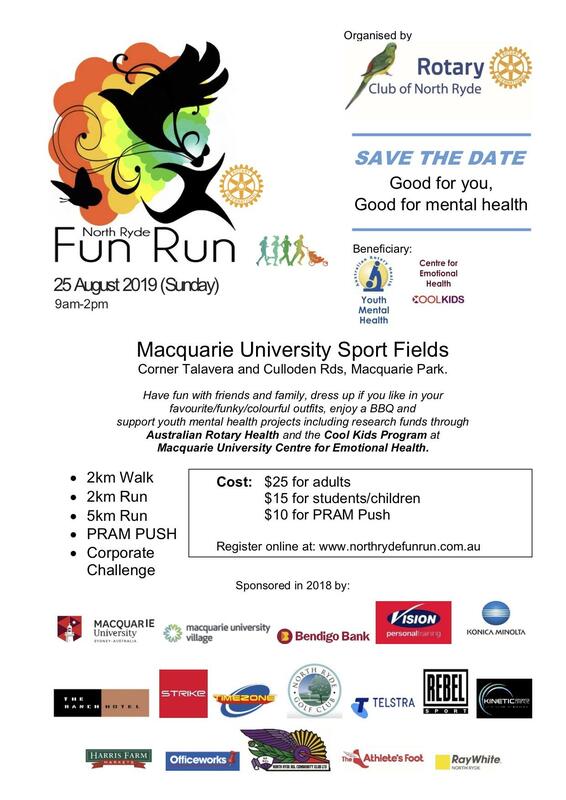 Some of the funds raised from the North Ryde Fun Run each year go towards the Centre for Emotional Health to support the Cool Kids program. The next meeting for the Club Fun Run Committee will be next Tuesday 9 April at my place, 93 Park Road Hunters Hill commencing at 7.30p.m.. All members are welcome to attend. 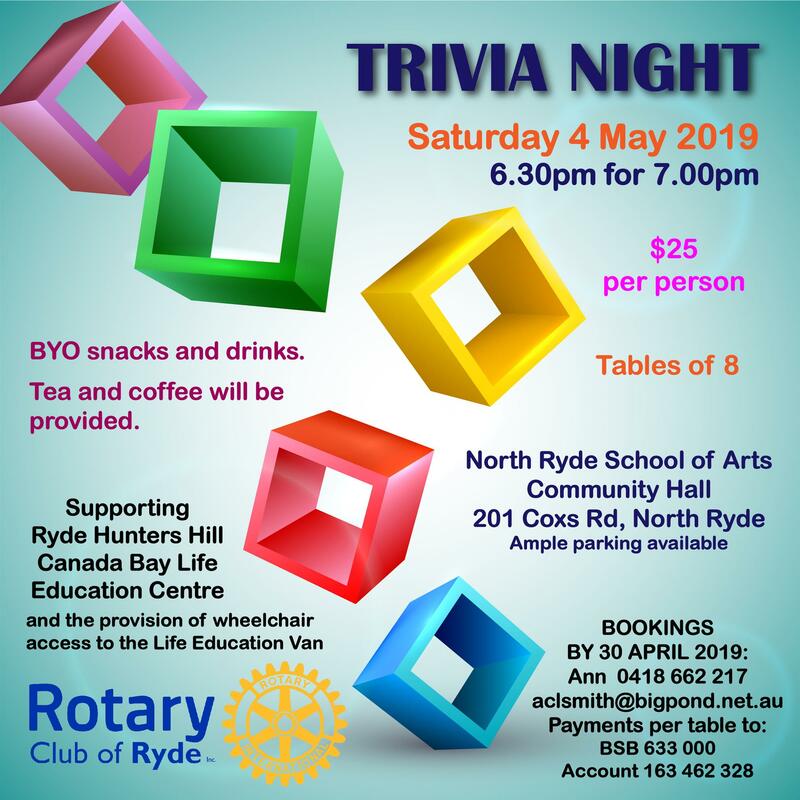 The Rotary Club of Macquarie Park's Trivia night is on this Saturday 6 April. please let me know if you would like to join us on a table. For more information see the article in this bulletin. 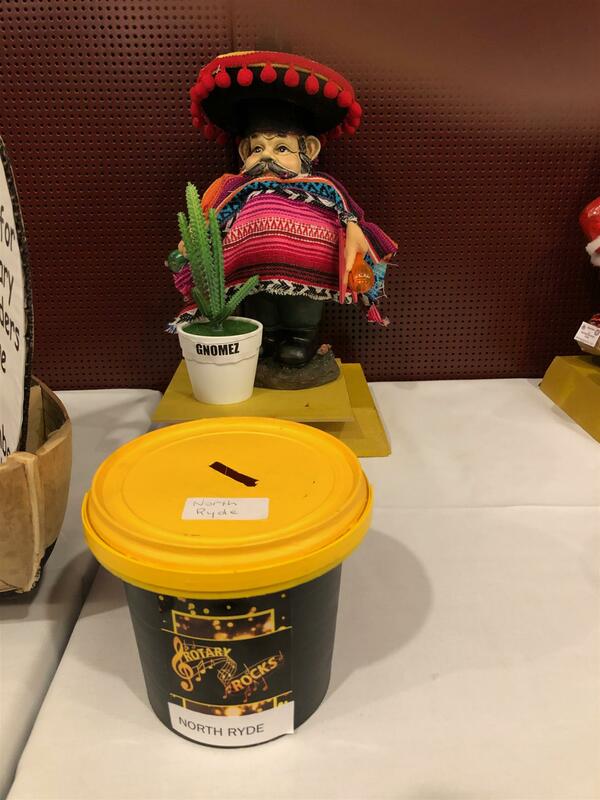 The Rotary Club of North Ryde's entrant in the Gnome competition -Gnomez! Mandy and Ian looking very Rock and Roll! Mandy won best dressed female rocker! 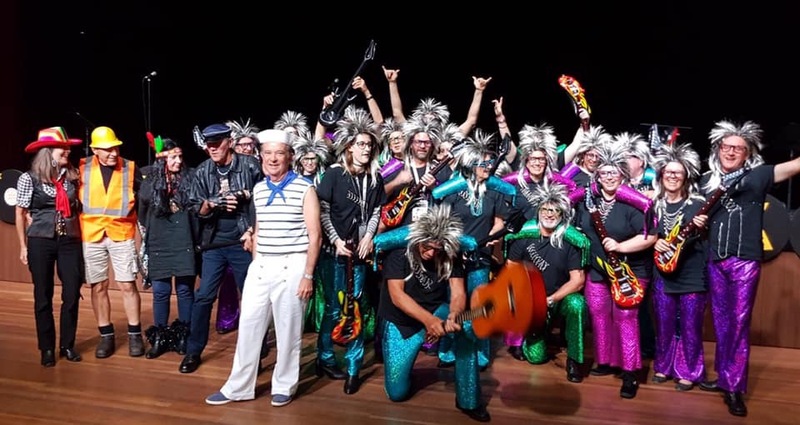 Macquarie Park and North Ryde Rockers! 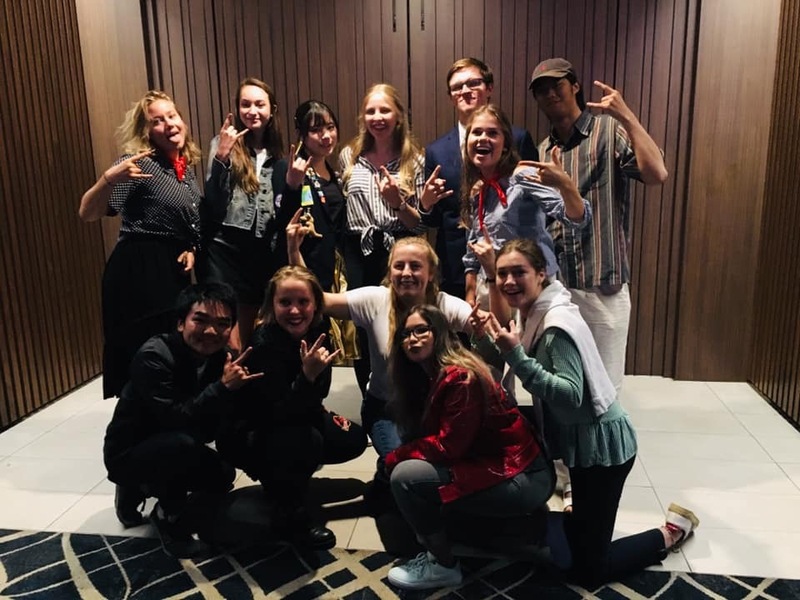 District 9685 Exchange students - great team! 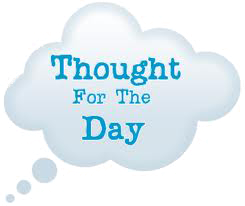 What is your goal/challenge for 2019? My Goal is participation in ShelterBox Australia Larapinta trek 2019 for Disaster Relief. I‘ve been inspired by the ShelterBox team and the amazing jobs that they support international disaster and humanity. It is my pleasure to be invited by CEO of ShelterBox Australia-Mike Greenslade, I will walk with him and others in this special trek at – Alice Springs (the RED CENTRE of Australia). Please help by click on --“Give Now” -- button to support our work by raising money as part of Disaster Relief. Everyone deserves a SHELTER and basic to survive. Your support is really appreciated. THANKS in advance! 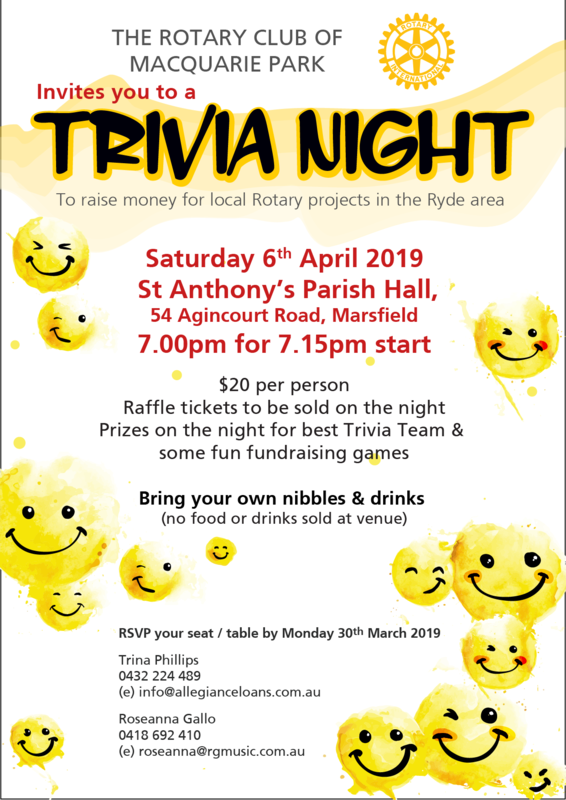 The Rotary Club of Ryde have invited Members from the Rotary Club of North Ryde to the 73rd Birthday Celebration Dinner. 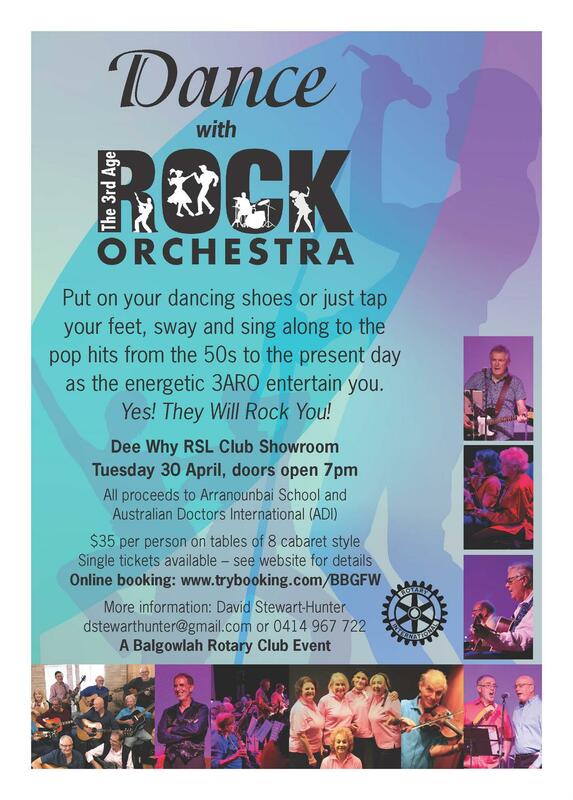 The dinner will be held on Tuesday 16 April 2019 at Carlingford Bowling Club, 334 Pennant Hills Rd, Carlingford. 6.00p.m. for 6.30p.m. 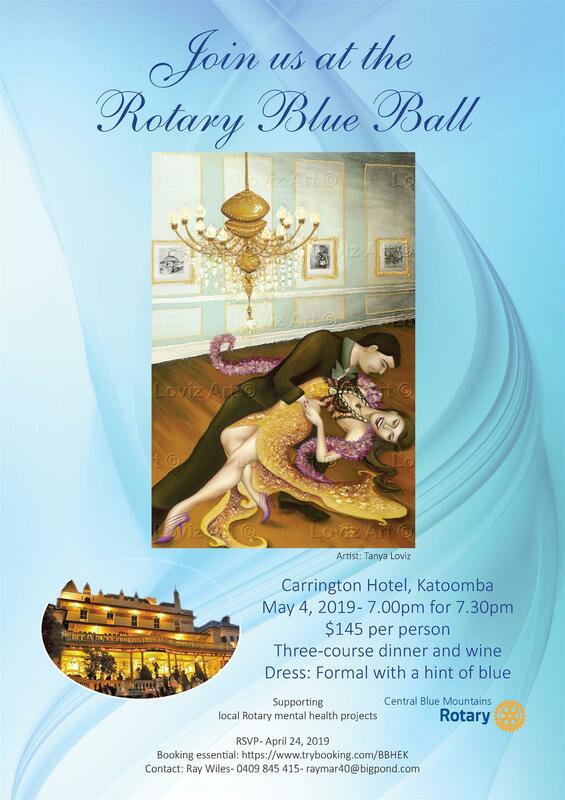 RSVP 11 April to Julie Thorp, j.thorp@bigpond.net.au mobile 0416208332. What's your reason for being a Rotarian? 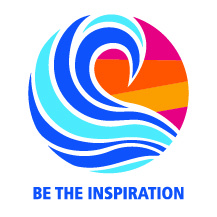 There are lots of reasons why people become members of Rotary. 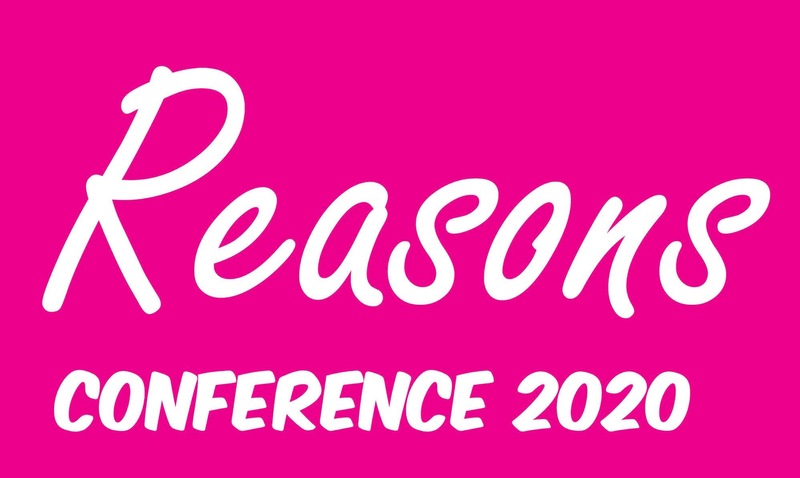 Reasons- we all have reasons- hear from amazing speakers and their reasons for doing the inspiring things they do. $200, if you register for the full conference before 30 June 2019. Register here. District 9685 2019 Conference Rotary Rocks! When you forgive you heal, when you let go you grow.